PHILADELPHIA, Pennsylvania—In the flush of reform and humanism that followed the American Revolution, political leaders and other thinkers began to re-examine the traditional ways society had dealt with systems of justice. Steeped in the idealism and determination that had created a new nation, they considered whether it was possible for prisons to become humane institutions that genuinely helped change the character of criminals, rather than the dangerous, disease-ridden, chaotic holding pens of the period. 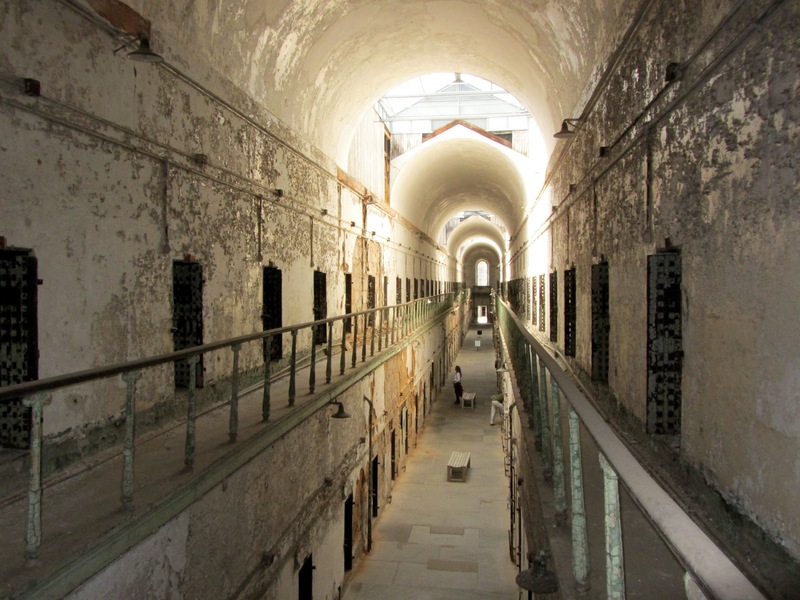 Pennsylvania's criminal justice reformers were among the most ardent, and by 1829 their efforts resulted in the opening of Eastern State Penitentiary, a massive facility on a lonely hill outside Philadelphia. 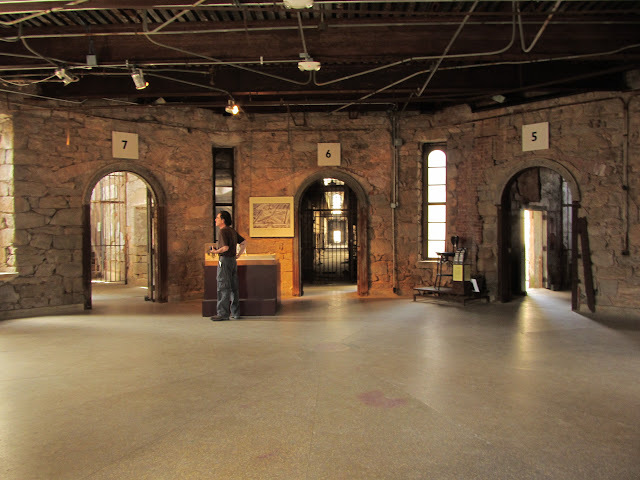 When it was completed, Eastern State was the world's largest and most technologically advanced prison. 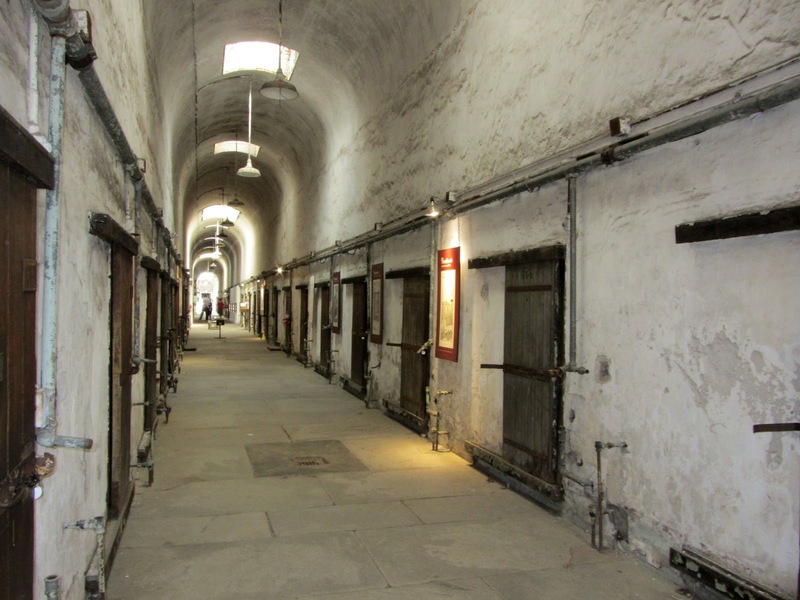 Cellblocks were built as spokes around a central hub, from which guards could view the corridors of every wing. Moreover, Eastern State incorporated a radically new system of prisoner isolation. Influenced by their Quaker beliefs, the reformers argued that, given the right circumstances and ample time alone, criminals could reflect on their misbehavior and reach a state of penitence for their sins. To promote this remorsefulness, complete isolation of prisoners was deemed necessary to eliminate any distractions which might interfere with their spiritual reflection. So there would be no need for prisoners to use communal areas, running water and toilets as well as central heat were provided to every cell, innovations which had not even reached the White House at the time. Each cell also had its own private exercise yard. Another aspect of the criminals' transformation process was mandatory labor, which reformers believed would encourage good habits and teach prisoners a trade. However, the need for labor did not override the essential principle of isolation for repentant contemplation. 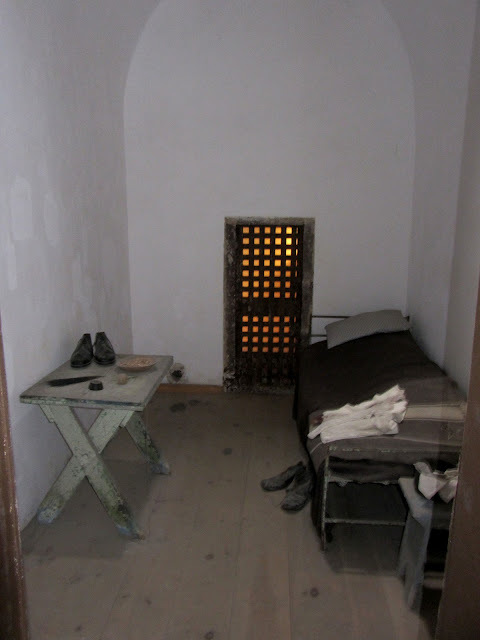 Rather than having the prisoners work in a central location, cells were equipped with small tables and tools needed for such trades as shoe repair or weaving. So convinced were the reformers that this new system would lead to prisoners' penitence, they even gave the compound a new name-- penitentiary. As the word about this new kind of prison spread, it became a worldwide sensation. Governments both in America and abroad began to copy what became known as the Pennsylvania System of inmate management. From the beginning, this modern wonder attracted tourists. Philadelphians traveled by horse and buggy to see the building. Even Charles Dickens placed Eastern State near the top of his must-see list when he visited the U.S. in 1842. Over the years, as new waves of reform and new philosophies arose, the isolation system came under increasing criticism. Its use slowly waned until it was officially abandoned in 1913. 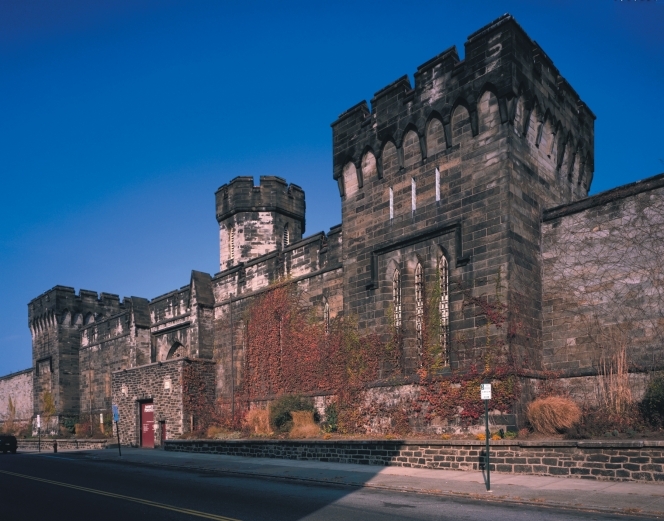 After Eastern State's infrastructure aged beyond repair and renovation, the prison was finally closed in 1970, sitting empty for the next 15 years until the property caught the attention of developers. Preservationists thwarted the demolition squad and by 1991 a campaign to stabilize the ruins was underway. Since 1994, the prison has been open for daily historic tours, and museum quality exhibits have been installed in some areas. For the past 20 years, Terror Behind the Walls, promoted as America's largest haunted house, has been a very successful Halloween attraction and fund-raiser for historic efforts. 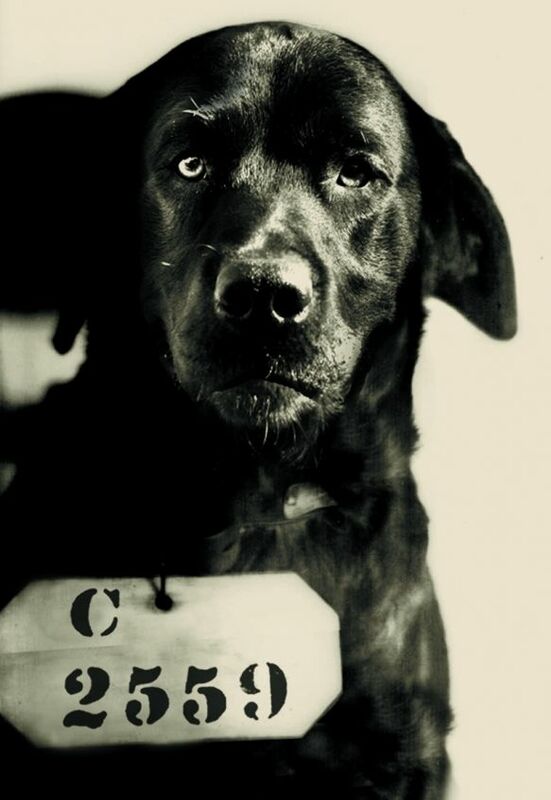 In a particularly egregious abuse of power, Pennsylvania Governor Pinchot exercised his executive powers in 1924 to sentence Pep, a black lab, to life without parole. Pep was convicted without trial for allegedly killing the beloved cat of the governor's wife. As the photo shows, he was even given an inmate number and mug shot. Pep ended up with the last laugh. He was much loved and lived among the other inmates for a decade. Now the ESP gift shop sells T-shirts, magnets and, yes, mugs with his mug shot. You can even purchase a dog tag on a 24" chain with Pep's likeness and the inevitable "bad dog" label. Eastern State also gave the notorious Al Capone his first experience at prison life in 1929 after he was sentenced to a year in prison for carrying a concealed handgun in Philadelphia. 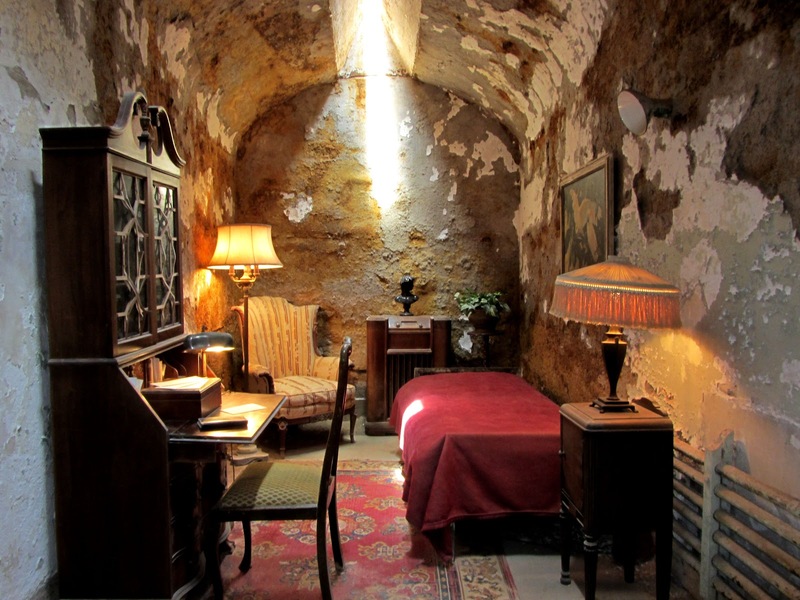 By this point in history, strict prisoner isolation had been relaxed, and prison officials allowed Capone to bring in elaborate furnishings, a radio, and other comforts for his cell, a privilege not afforded to most inmates. It was said that Capone enjoyed listening to waltzes in his cell. Without doubt, Eastern State was the most unusual tourist attraction we have visited on this trip, but the experience taught us a lot about the history of criminal justice in America. And we didn't even have to pay the $12 admission charge, thanks to the friendly guide at Historic Philadelphia who gave us a couple of free tickets. We had a new letterbox with us and really had to fight the urge to hide it in the bowels of this eerie place, but our objection to planting a box in a place with an admission cost suppressed that temptation. 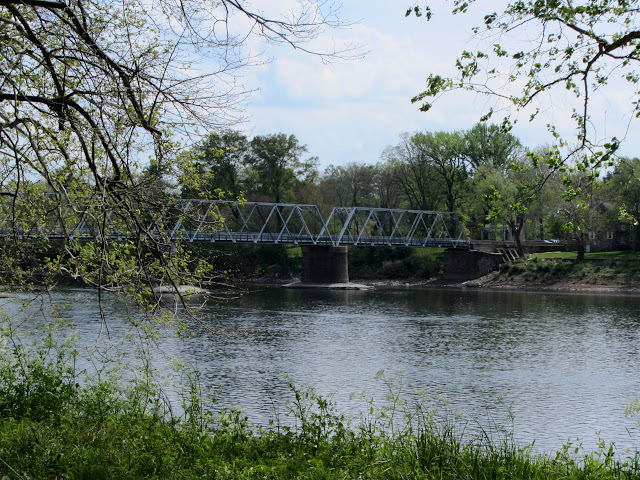 On our way east this afternoon, we had to cross the Delaware River, the boundary between Pennsylvania and New Jersey. What better place to traverse the river than Washington Crossing, the small Pennsylvania town located at the site where George Washington famously led troops across to Trenton during the Revolutionary War? In a local park, Washington and his troops perpetually brave the elements in the form of a statue donated to the town by the Indiana Limestone Industry in 1976. 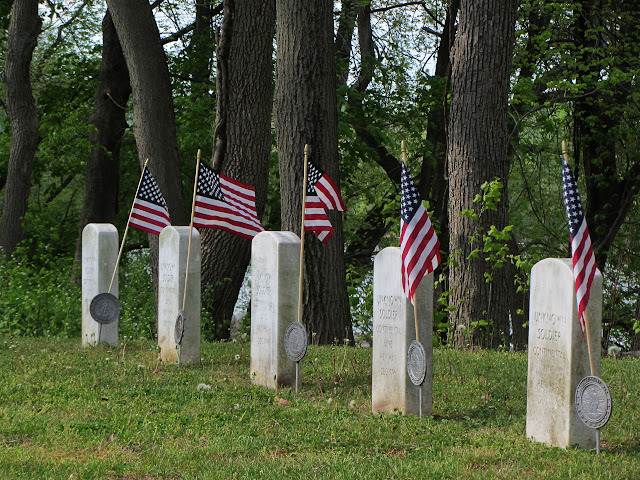 No less than three parks in the immediate vicinity (on both sides of the river) are named for the event—Washington Crossing Park, Washington Crossing Historic Park (there seem to be two of these), and Washington Crossing State Park. They all tell the same story. On Christmas evening, 1776, General George Washington and some 2,500 Continental soldiers crossed the Delaware River from their winter encampment in Pennsylvania into New Jersey on their way to attack Hessian troops holding Trenton. Their surprise attack on the British mercenaries was successful, a desperately needed victory after a string of defeats. Because this victory renewed the colonists' spirits, the battle has often been called the "Turning Point of the American Revolution." After finding a letterbox in one of the parks, we followed GPS directions into New Hope, PA, where we would cross into New Jersey. Our crossing turned out to be a mild challenge, as we cruised into the middle of New Hope's annual Renaissance Festival. By our estimate 74% of the residents of Bucks County, along with an impressive representation from western New Jersey had turned out for the event. Creeping along Main Street at 0.5 mph, we finally escaped across the river and made our way to the Hampton Inn at Parsippany, where we found much nicer conditions than those experienced by either Washington's troops or the residents of Eastern State, even Al Capone.